Recent studies of sediment in the North Atlantic’deep waters reveal possible cyclical patterns in the history of Earth’s climate. The rock fragments in these sediments are too large to have been transported there by ocean currents, they must have reached their present locations by traveling in large icebergs that floated long distance from their point of origin before melting. Geologist Gerard Bond noticed that some of the sediment grains were stained with iron oxide, evidence that they originated in locales where glaciers had overrun outcrops of red sandstone. Bond’s detailed analysis of deep-water sediment cores showed changes in the mix of sediment sources over time: the proportion of these red-stained grains fluctuated back and forth from lows of 5 percent to highs of about 17 percent, and these fluctuations occurred in a nearly regular 1,500-year cycle. Bond hypothesized that the alternation cycles might be evidence of changes in ocean-water circulation and therefore in Earth’s climate. He knew that the sources of the red-stained grains were generally closer to the North Pole than were the places yielding a high proportion of“clean” grains. At certain times, apparently, more icebergs from the Arctic Ocean in the far north were traveling south well into the North Atlantic before melting and shedding their sediment. Ocean waters are constantly moving. And water temperature is both a cause and an effect of this movement. As water cools, it becomes denser and sinks to the ocean’s bottom. During some periods, the bottom layer of the world’s oceans comes from cold, dense water sinking in the far North Atlantic. This causes the warm surface waters of the Gulf Stream to be pulled northward. 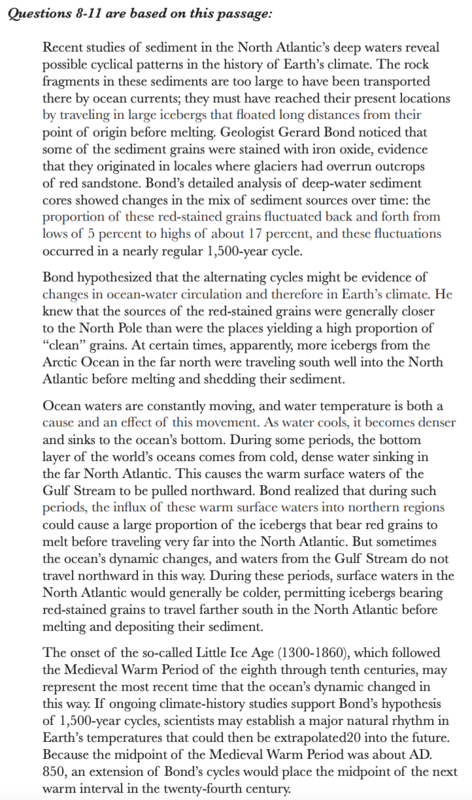 Bond realized that during such periods, the influx of these warm surface waters into northern regions could cause a large proportion of the icebergs that bear red grains to melt before traveling very far into the North Atlantic. But sometimes the ocean’s dynamic changes, and waters from the Gulf stream do not travel northward in this way. During these periods, surface waters in the North Atlantic would generally be colder, permitting icebergs bearing red-stained grains to travel farther south in the North Atlantic before melting and depositing their sediment. The onset of the so-called Little Ice Age(1300-1860), which followed the Medieval Warm Period of the eighth through tenth centuries, may represent the most recent time that the ocean’s dynamic changed in this way. If ongoing climate-history studies support Bond’s hypothesis of 1,500-year cycles, scientists may establish a major natural rhythm in Earth’s temperatures that could then be extrapolated into the future. Because the midpoint of the Medieval Warm Period was about AD.850, an extension of Bond’s cycles would place the midpoint of the next warm interval in the twenty-fourth century. According to the passage, which of the following is true of the rock fragments contained in the sediments studied by Bond? A) the majority of them are composed of red sandstone. B) they must have reached their present location over 1,500 years ago. C) they were carried by icebergs to their present location. D) Most of them were carried to their present location during a warm period in Earth’s climatic history. E) They are unlikely to have been carried to their present location during the Little Ice Age. 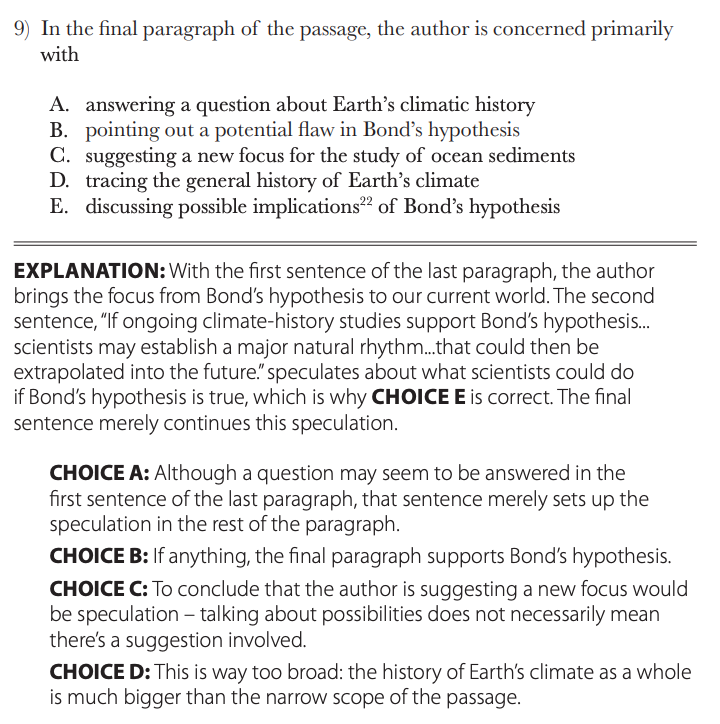 E) discussing possible implications of Bond’s hypothesis. According to the passage, Bond hypothesized that which of the following circumstances would allow red-stained sediment grains to reach more southerly latitudes? A) differ very little in composition from the portions that correspond to the Medieval Warm Period. C) would be likely to contain a proportion of red-stained grains closer to 17 percent than to 5 percent. 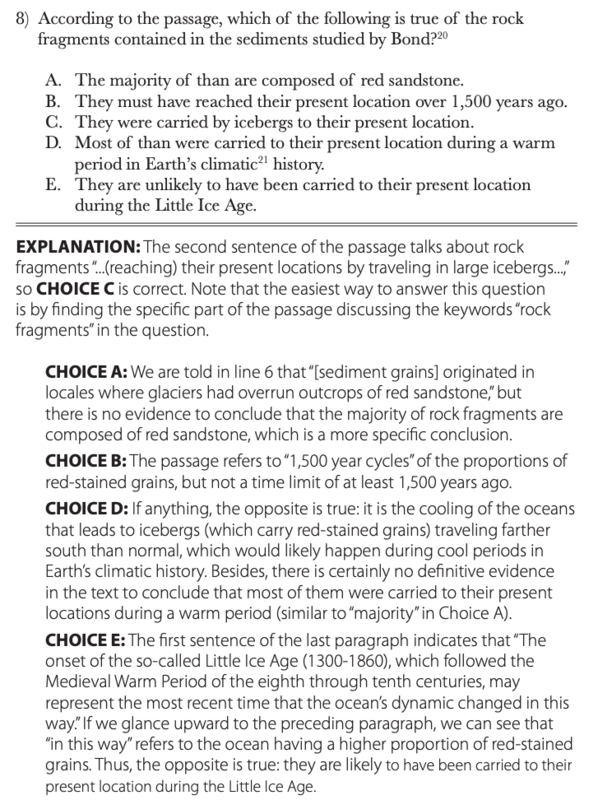 1) The easiest way to answer this question is by finding the specific part of the passage discussing the keywords “rock fragments” in the question. Choice C is the right answer. 3) ​Searching for the part of the passage discussing “southerly latitudes” leads to the last sentence of the third paragraph, because it also provides reasoning for the southerly travel. Choice E ​is correct. 4) Little Ice Age was a time when surface waters were colder, but there is evidence in the first sentence of the fourth paragraph. 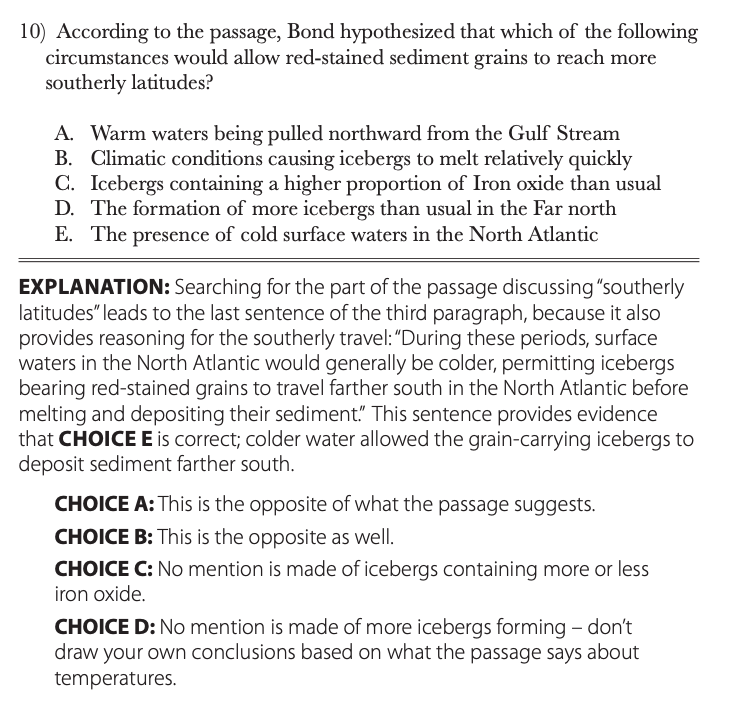 Choice C ​is correct because during those colder periods, more icebergs would have floated into the North Atlantic & the red­stained grains deposited would therefore be at the higher end. Recent studies of sediment in the North Atlantic’deep waters reveal possible cyclical patterns in the history of Earth’s climate. The rock fragments in these sediments are too large to have been transported there by ocean currents, they must have reached their present locations by traveling in large icebergs that floated long distance from their point of origin before melting. can someone elaborate question 4? to float farther south, so sediments must have been deposited further south during that time. therefore, be at the higher end. During these periods, surface waters in the North Atlantic would generally be colder, permitting icebergs bearing red-stained grains to travel farther south in the North Atlantic before melting and depositing their sediment. The last sentence of the third paragraph shows you that E is the correct answer. Ask if something is still unclear to you. 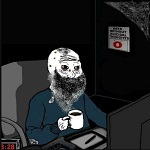 I took 10mins and answered all correctly. Can you please suggest the ideal time to finish this long paragraph (read+analysis) with 4 questions? Spend around 6 minutes for a passage with 3 questions and 8 for a passage with 4. I.E. for a passage < 40 lines on average 6 minutes and > 40 lines 8 minutes. Each question to solve 1.30 seconds at most two minutes. After this, pick your answer whether you do know or is s strategic guess and move on.